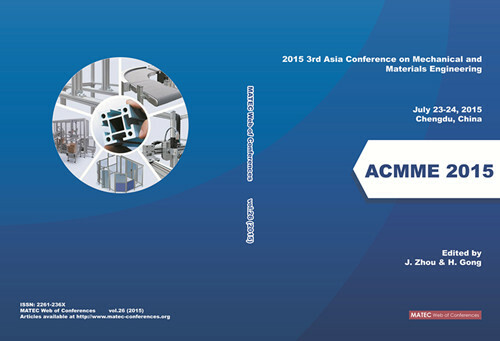 2015 3nd Asia Conference on Mechanical and Materials Engineering (ACMME 2015) was successfully held in Green Land Hotel during July 23-24, 2015. There were 3 sessions. Session chairs Dr. Khiew Poi Sim, Dr. KWANG SIK CHUNG and Dr. Ken Mao listened attentively to the authors reports. Each session was well organized and presenters actively discussed with each other. According to the strict grading scores, finally three best speaker came out. They were: Kalaimani Markandan(Session 1), Dianzi Liu(Session 2), and TAN CHING NG(Session 3). Papers of ACMME2015 are indexed by Ei Compendex! Papers of ACMME2015 are indexed by Scopus!